I’ve just finished watching the live webcast, from City Hall in London. Basically the senior police officers gave a power point presentation about how wonderful it would have been if they had the use of water cannons during the Student Protest and Tottenham Riots. One audience member said that Boris Johnson had said that water cannons WOULD NOT have been appropriate at the student protests because it was a dynamic and fast moving protests. She said if the police cannot be trusted with a baton, then why would the public trust them with a water cannon. Ben from NetPol was also at the meeting and asked an excellent question about how the use of water cannons would escalate the situation rather than calm it. On Old Broad Street I was pushed on my back by an inspector, who was moving journalists backwards. I went sprawling and broke my laptop. When I said [to the inspector]: ‘You just pushed me over,’ he got his face really close to mine and shouted at the top of his voice, ‘Don’t be stupid, that’s a ridiculous suggestion’. The police were trying to hold photographers back to prevent us from photographing the demo. Effectively, none of us could work properly. Later, after midday on Threadneedle Street, police were hitting the first four rows of the crowd but it was having no effect because of the surge of people from behind. The police were lashing out. I think it was a mix of British Transport police and Metropolitan police officers. There were loads of baton charges. I was swirling about in the crowd. After taking a picture at 1:21pm, I held up my camera in my right hand and had a press card in my left hand. I shouted to police: ‘I’m press, I’m press’. The officer who was coming toward me made eye contact and shouted: ‘I don’t care. Get back, get back.’ There was nowhere for me to go. He then swung his truncheon upwards to hit me on my left elbow. He certainly saw my press pass. I’ve never felt pain like that in my life. I couldn’t open my eyes. Later there were lumps on my arms the size of potatoes. My arm was broken. I’ve now ordered a military Kevlar helmet with press written on the front and back for protection when I cover another demonstration. I have to say, at least the senior police officers had the good grace to look uncomfortable at this. What he was trying to get at, is how would a water cannon differentiate bedtween a peaceful protester, a violent protester and members of the press. The highlight, was when Dietrich Wagner, the German pensioner who was blinded by a water cannon during an environmental protest in Stuttgart, spoke through a translator. Dietrich had been able to come to the UK at the request of the 38 degrees group, who through donations to their website, had paid for his flight and accommodation. The room was deadly silent as the interpreter explained his injuries; 5% vision in one eye and none in the other, apart from being able to distinguish between light and dark. Dietrich said that the German Police authority had 40 to 50 pages of regulations on use of water cannons but that in the heat of the moment (or in the heat of battle as he described it) those 40 to 50 pages of regulations were forgotten. He went on to say that after what happened to him, the police, who had normally been held in high regard lost the respect of the public. In fact, he said that there were further public protests against the use of water cannons as a result of what happened to him. He then directly addressed the senior police officers and the deputy mayor and said “stop this nonsense” there was then thunderous applause from the audience. It’s the police that cause the violence. The bankers took all our money, people protested and we are the bad guys. Because the bankers had taken all our money, student fees increased, we protested and we are the bad guys. As for the Tottenham riots, it wasn’t because people wanted a new pair of trainers from JD Sports, it was because black youths were disengaged with the police due to frequent stop and searches and the death of Mark Duggan was the straw that broke the camels back. He then asked if this public debate would actually be taken into account or was it simply a tick box exercise for the police. No answer was the stern reply. There was no public support for the use of water cannons at all. 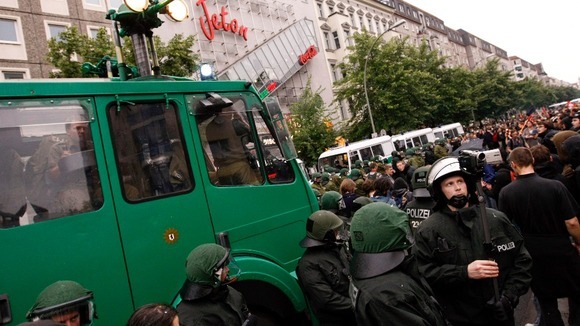 The proposal by the Metropolitan Police Service to buy three second-hand water cannon from Germany is bitterly opposed by the London Assembly. The assembly voted overwhelmingly on Friday assembly to reject the £200,000 plan. Boris Johnson’s official Deputy Mayor for London, Victoria Borwick, was among four Conservatives who voted with the opposition. The Liberal Democrats and Greens are firmly against the idea. Labour accuse the mayor of rushing a decision. The Home Secretary is expected to decide whether to issue a license for water cannon in London next month. We shall watch this space and see what happens. This entry was posted in Uncategorized and tagged Boris Johnson, Dietrich Wagner, Police, protests, Theresa May, water cannons. Bookmark the permalink.